Rome-based trombonist, bass trombonist, and tubist Massimo Pirone is an established jazz and commercial musician, having recorded with Bill Reichenbach, Mark Nightingale, and Bill Watrous and collaborated with Quincy Jones. 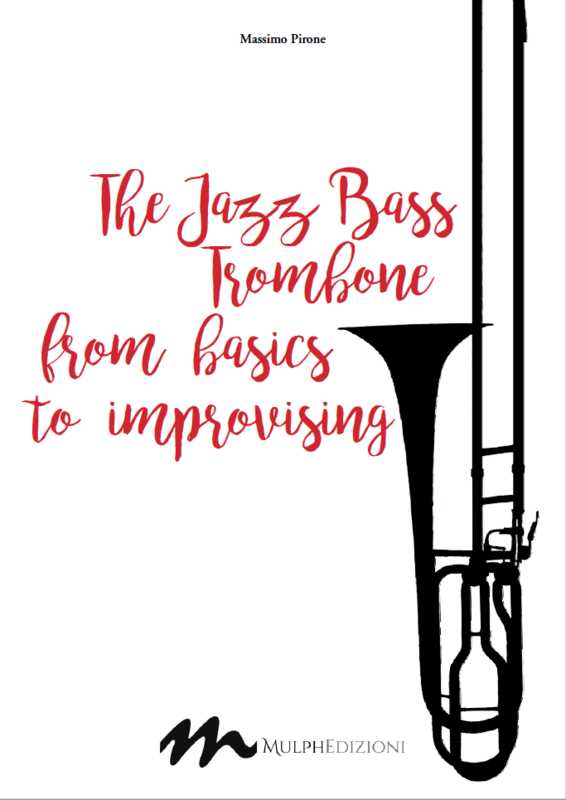 Author of The Complete Method for Trombone from Basics to Improvising, he now focuses on the bass trombone in this book also published by The Mulph Music Publishing House in Italy. The book targets “the young trombone basso student” during the initial years of study, with Italian and English text addressing embouchure, warm-up, stamina, improvisation, classical music, and commercial music. A position/harmonics chart and basic illustrations for posture, breathing, embouchure, and tongue-placement precede the first notated exercise on page 23. Within a few pages, these exercises progress far beyond the skills of a beginner; and no breath-marks or slide- or trigger-position markings are indicated within the many pages of continuous passages addressing flexibility, legato, staccato, and upper range, the latter exclusively in tenor clef. A brief entreé into double- and triple-tonguing leads to scale studies, key changes, and more melodic studies. Jazz enters on page 59, with examples of swing notation and interpretation. Etudes include considerable rests and barely fall below the staff, providing more material at the basic level than within the earlier classical pages. A jazz listening-list follows, as well as a few paragraphs as to how to learn to improvise. “You must memorize all the scales and arpeggios, create musical phrases, and be able to transpose them in all keys.” Exercises follow that outline major scales and chords. Atypically, the sample bass line over a ii-V-I progression is all arpeggios; and a sample bass line for the blues rarely hits chord roots. Melodic patterns (“licks”) in various keys follow, with an invitation to transpose the rest on your own. A page of doodle-tonguing exercises appears before perhaps the most melodic entries of the book: sample jazz etudes in which fine melodies appear yet without related chord symbols. Again, one can play 32 bars without seeing a rest, even when measures are filled with sixteenth notes; but the melodies capture essential styles for a jazz or commercial bass trombonist. A recording of the exercises would be a welcome pedagogical guide for the student.